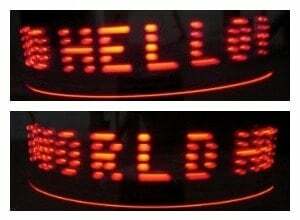 Make a simple persistence-of-vision (POV) display with an Arduino for about $6. Here is a simple project using an Arduino and some LEDs. What we are going to learn here today is how to make a POV display or Persistence-Of-Vision display. It is made out of just 6$ worth of components. 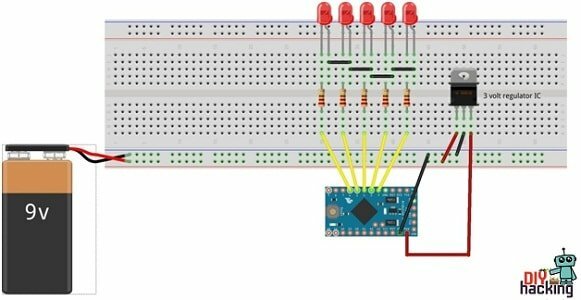 This tutorial gives will teach you how to make a simple and a cheap Arduino POV display. 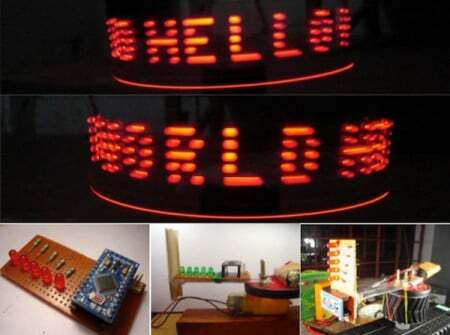 We can use this display as a pocket-sized portable message showing device and tabletop clock. How Does the POV Display Work? Each row represents the 5 LEDs we use to make the Arduino POV display and each column is a time interval. Each element in the row represents the state of the LED at that given time. This way we can visually see the letter E formed by the LEDs but the time interval would be very small in milliseconds. Due to the short time intervals and the ability of the LEDs to turn ON and OFF very quickly we can see the letter E as all the 3 images merge. As the motor is spinning and time passes, each LED moves from one position to the next, so all these images merge together. Cut the perf board to the appropriate size. 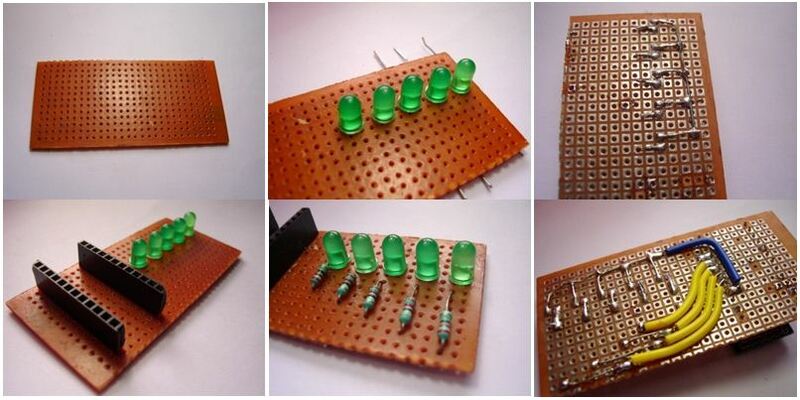 Then connect the LEDs and solder it as shown in the figure below. Then connect the Arduino case (where Arduino is to be placed). Connect the resistors to the positive pins of the LEDs and connect the negative pins together. Then connect the LEDs to the Arduino. The first LED(on the upper side) connects to the Arduino pin 2. Connect the second LED to the Arduino 3rd pin. Connect all LEDs as shown in the circuit diagram. At last, connect a pin for mobile battery. For plug and play use, connect a switch. If you don’t have a mobile battery, you can also use a 9-volt battery. In this circuit, I have connected a 9-volt battery to the Arduino with a 3V regulator. 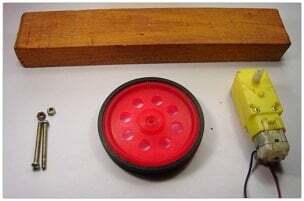 Drill and make holes on the wooden block to attach the motor and connect the motor as shown in the figure. Connect the wheel and screw the two bolts on the holes of the wheel. Then cut a half of the scale and drill two holes and attach the scale and screw it (the electronics part is going to be attached here). 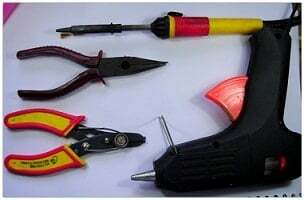 Take a small plastic piece (as shown in the figure above) and connect the plastic piece perpendicular to the scale using the glue gun. Then take another piece of plastic and screw it on the other side of the wheel. Then make the mobile battery pack by soldering extension wires to the terminals. Connect the electronic part (the display board with LEDs) to the perpendicular part and connect the battery to the other side. Balance and fix the wheel on the center (make the center of gravity the center of the wheel). This is for minimizing vibration when it rotates. For my Arduino POV, I changed the Green LED to a Red LED because when I capture the video using a camera, the green color is not seen clearly. Green color scatters more than Red (red color has the highest wave length) and can only be captured using a camera with better Frames Per Second. I programmed the Arduino Pro Mini using ‘FTDI USB to serial converter’. 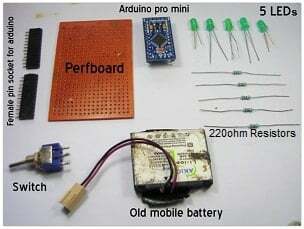 You can also program the Arduino Pro Mini using Arduino Uno board. Buy an FTDI USB to serial converter. This is how easy it is to make an Arduino POV display at home. You can make it in an hour or two (depending on your soldering skills). 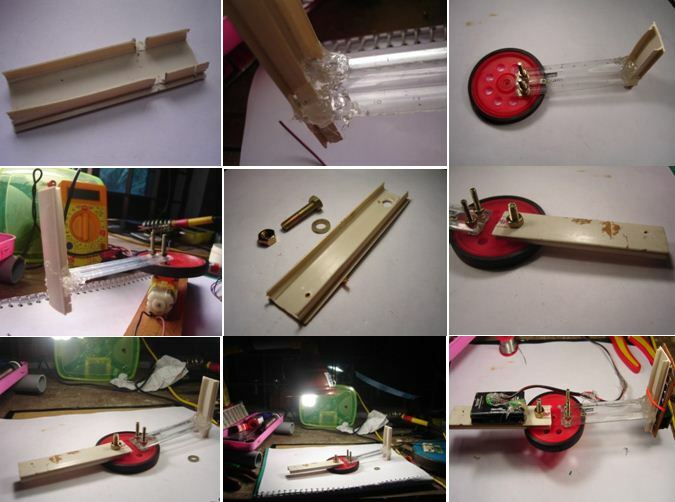 Make your own Arduino POV and show it off like a boss.